Note: These posts were written by students at St Lawrence Academy in UK. They were originally posted on www.radiowaves.co.uk - a safe social learning platform for schools. In the modern world computer technology seems ever-present; it surrounds us on a daily basis. Jobs of the future will most likely involve an element of computing so possessing a good understanding of a range of computing skills is increasingly important. Consequently IT skills and capability developed by the subject at school are just as important if not more relevant than the English and Maths capability developed at school. The skill of programming (the process of writing and maintaining the source of code of a computer) is complex to learn but a basic knowledge would only be an aid in the technological world. Key skills such as problem solving can be learnt through programming; the skill involves an ‘exact’ way of thinking. Firstly a solution to the problem must be reached before the programmer can then begin to communicate their solution with the computer. Programs are a set of instructions that a computer must follow to perform a task and they are written in a programming language. To learn how to program you must achieve an understanding of the instructions (the programs control structure and how it works), the data (data types and sometimes objects involving attributes) and syntax (rules that decide how a program can be constructed) that are part of programming. When first learning how to program, difficulties involving the technical language can be a barrier for the learner; learning how to specify and test programs using tools that are available takes time to remember and the formality of the programming language and structure make the skill difficult to learn. Perhaps the complexities of the skill make it desirable. However even a simple programming language such as Scratch teaches the fundamental elements of programming which could be useful later on in life. Scratch allows students to recognise that programming is modular and whole is greater than the sum. Simple commands for example, hide a graphic, graphic stay on screen for a certain amount of time or using a variable to record a game score take some of the mystic out of video games and allow students an opportunity to understand how video games, apps and computer software are produced. Once this interest has been sparked there is no telling where it may end. It is well documented that the founders of Microsoft and Facebook had good technical skill and programming ability as well as many other skills. In a technologically enhanced world in which we live, people with good computer skills are always likely to have an edge over their less computer literate colleagues when seeking employment. As Naace have recently state 75% of all jobs in the UK require computers skills, this edge brought about from having good ICT and programming skill is only likely to increase over time. Especially, if more organisations are looking for in-house software developments to give them a competitive advantage over their rivals. Computer programming (often shortened to programming or coding) is the process of designing, writing, testing, debugging, and maintaining the source code of computer programs. This source code is written in one or more programming languages. The purpose of programming is to create a set of instructions that computers use to perform specific operations or to control something or even for animations. Most devices have been programmed by the developer to create a software or device example: An Xbox would have been programmed by the developer which isn’t an easy process but when it has been completed you wouldn’t think that someone has sat at a desk and programmed the device. 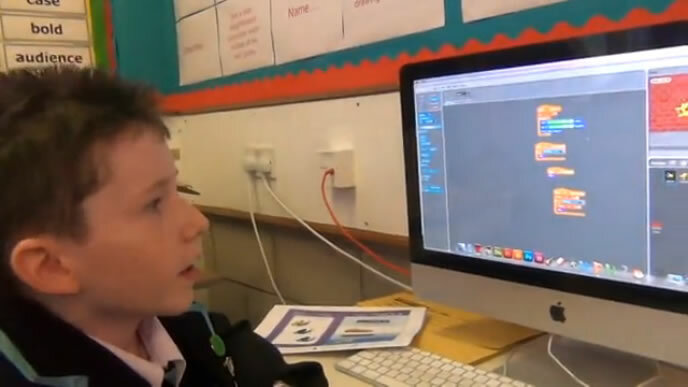 There are quite a few programming programs example: Scratch this is programming software that is great for simple or quite advanced commands it is used in many areas of ICT to create animations, games and simple/advanced commands that can be used for making programs. Programming should be taught in lots of areas in ICT to show children and teenagers how to create programs and software, it is a very good area to cover in ICT lessons it also can be very fun for children to make games and animations and even programs. Programming will in courage pupils to understand how games and applications work. Scratch is a great program for programming and is very easy to use. There are lots of shortcuts for people who find it hard to use programming software. For first time users scratch is very easy to use you, they also have help cards online to help first time users create applications and other things using programming (the web address is http://info.scratch.mit.edu/Support/Scratch_Cards). Scratch gives you a better understanding on how games and applications work, they are all based on commands entered onto a program like scratch and then can be transformed into what looks like a game but actually is a bunch of scripts that make the game work. For instance if you take the duck shoot game that can be created with scratch all that is basically is a group of scripts put together to make a game. Using programming programs like scratch can be difficult especially if you are programming a device such as a Wii console the skill can take several years to learn. However if taught correctly and appropriately to your audience you can master the skill within weeks and then build on that skill until you feel like you really understand how to program things. This might lead to not just programming simple games on scratch it could be a lot more challenging like programming a whole network or system or even a new technology! Remember … Everything is achievable when you try. There are some difficulties when teaching programs like scratch because the teacher shouldn’t do all the work which in this case can happen because some students won’t understand maybe how to use it or the different scripts involved. Some of the lessons taught using scratch might become to get more advanced so other students won’t be able to keep up but others might. It can be quite difficult to teach programming. Scratch helps you think in a logical way because you don’t have to create another character/sprite exactly the same as the first one you can duplicate it, and all the different scripts are organised in folders to make it easier to find what you’re looking for. Also the scripts can be dragged on to the screen and be organised in the correct way, so if you accidently drag the script into a different place you just drag it back into the correct place. This is a great program for older and young children who like to animate and play around, there is lots of interesting features that will in courage them to use this program and become more confident with using different programs within ICT. There are many interesting commands that can be used to animate and control the sprite including: Moving around the screen, changing the way it looks and many more. You can also change the sprites and backgrounds and it’s really simple, (it just takes a few clicks). It’s a great program that you can download for free and straight away get started at making animations using different commands on Scratch. It’s a great tool for programming and an even better one for all round fun! There aren’t many negatives with this program apart from it could be a little bit more child friendly (for example: The words used could be simplified so that young children will find it easy to read) the rest is very good. It’s very easy, just type in Scratch to Google or any other search provider then click download finally choose your computer type, example: Windows. In Conclusion, the scratch program is great for programming and animating and will boost you ICT skills. I am sharing my personal experience about the difference between the education system in India and America and how I am using scratch to change other lives. 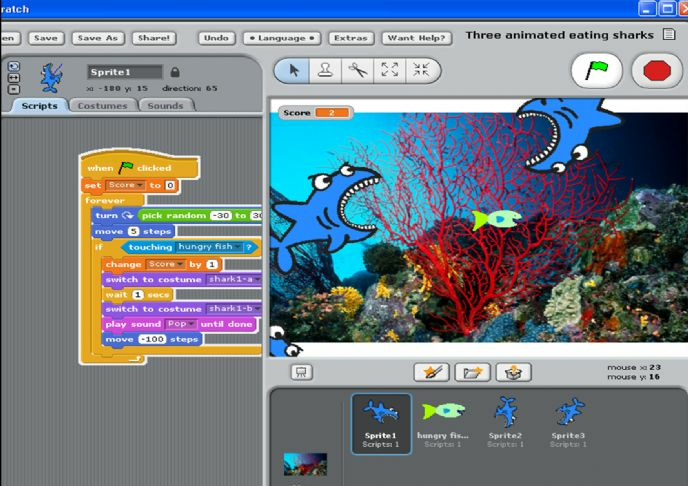 This article includes photos as well as practical advice for educators on how to teach the fundamentals of programming using Scratch.